Chakrapani Ayurveda Clinic & Research.. The main ingredient of Haridra Khand is Turmeric which is processed with ghee and sugar candy. Turmeric is a known anitiallergic herb and this medication can be effectively employed in allergic conditions of the respiratory tract and skin like urticaria. 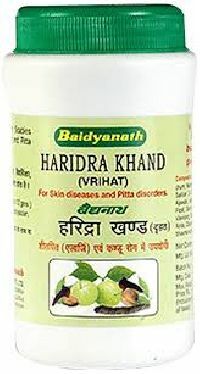 It is one of the best blood purifier so it can be employed in all diseases which originate from blood.